Fixed Before/After tabs work in Preview panel. 'Resize Canvas' task: fixed the setting of the height in percents with the "Dimensions" crop method. Fixed working of Rename/Move task. Some fixes in Create Contact Sheet task. Some fixes in Color Balance task. Fixed problem with multithreaded writing in the Save to PDF task. Fixed loading of thumbnails after renaming images. Fixed index numbering in tags. Fixed reading Unicode EXIF tags. 'White Balance' task: added the ability to select a color for white color. 'White Balance' task: added the ability to select white color in Preview. 'Resize Canvas' task: added the ability to set the cropping frame on the 'Before' tab of the Preview window. 'Save To Animated GIF' task: added the ability to optimize the file. 'Save To PDF' task: added the ability to save the pages in order (only for multithreaded processing). 'Save As' task: fixed saving to DDS with multithreaded processing. Added the ability to turn off replacement of spaces with underscores in file names. Preview window: Now when you update, it does not automatically switch to the "After" tab. 'Optimize for Web' task: updated interface. 'Resize canvas' task: fixed setting of height in the "Borders" mode, if you select "%" for units. 'Watermark' task: Corrected the watermark movement in the Preview window, if selected non-pixels for the units. Task processing: now disabled tasks do not perform the initial processing. Image list: Corrected sorting by name for names with numbers. Image list: fixed image movement. Program still seeing updates, looks like there's some nice automation tools built in. 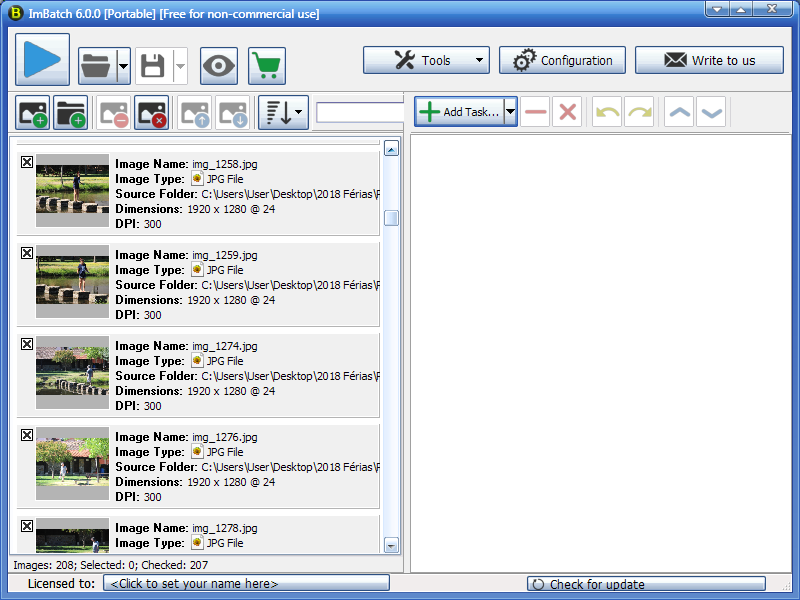 ImageMonitor: added support for pdf and dds formats. ImageMonitor: removed the requirements for admin rights. Fixed the "Preserve image date/time" option. Fixed display order of columns in the Table mode. 'Optimize For Web' task: added "Preserve Structure" option. 'Time Shift' task: fixed task work. Fixed preserving of the original date/time of files, if the corresponding option is selected in the settings, but 'Save as' task was not added. Fixed preserving of the original date/time of files, if the corresponding option is selected in the settings, when saving in the EXIF/IPTC Editor. 'Save to PDF' task: added "File path" parameter. 'Set Background Image' task: added "Crop" parameter. Added the ability to disable hints for tasks. Image Monitor: Added the ability to exclude subfolders from monitoring. Added the ability to insert supported functions into expressions with menu. 'Watermark Text' task: fixed the text stamp size measurement. 'Set EXIF/IPTC Tag' task: changed setting of numeric tags. Now you can use expressions. 'Resize' task: fixed setting the value for DPI. Fixed displaying in the Preview window the results of the 'Set DPI' task. 'Resize' task: fixed the size calculation in the preview. 'Resize Canvas' task: fixed the size calculation in the preview. Fixed localization of text input fields with tags. EXIF/IPTC editor: fixed work with GPS EXIF tags. 'Save to PDF' task: added transparency support for transparent images. 'Save to PDF' task: fixed saving to PDF when saving to separate files. 'Publish on Facebook' task: fixed the work of the task when publishing to the page's album. 'AutoCrop' task: fixed work of the task. 'Stroke' task: fixed work of the task. 'Resize' task: the work of the task has been fixed, if the "Resize type" parameter is set to "Reduce Only" or "Enlarge Only". ImBatch v6.0.0 released (download and changelog at www.highmotionsoftware.com/download-center/imbatch). Finally made up my mind to add this program to the database but the latest version is having issues on my Win7x86 system. It's just launching and never actually starts, running at 100% in the background until I End Task it. For reference, here's the entry draft so far: https://www.portablefreeware.com/index.php?id=2971 Please don't vote for the entry until this gets resolved. I hadn't checked the latest version but decided to after seeing your alert -- it works fine here, in my Windows 7 x64 SP1. Previously unnoticed: ImBatch doubles as a pretty decent EXIF editor.